Despite its location in southern California less than 100 miles from the coast, Anza Borrego remains one of the wildest of the West's wild places. We spent a glorious week there between Christmas and New Years in 2015, and returned two years later to attend a rally for Four Wheel Campers. It was a long drive, but we finally got nowhere. Arriving at sunset, we made our way to a boulder-strewn cover in Blair Valley. When I went out to pee in the middle of the night, there was no need for a flashlight. The moonlight was dazzling on the gray granite boulders and sandy dry lake bed. Another reason not to have an indoor toilet! I mistook this loggerhead shrike for a mockingbird, but my birding friends set me straight. Although it's mid-November, we quickly realized that even this late in the year it's almost too hot to hike in Anza Borrego. So we started early and stayed high, beginning with a pleasant ramble in Culp Valley to an overlook of Borrego Springs. From there we followed game trails to Peña Spring, tucked into a tangle of lush vegetation high in a small side canyon. We rode out the heat of the day at a cafe in Borrego Springs, then drove out to Fonts Point for the sunset, where there was an impressive view of the churned up earthen canyons that comprise the Borrego Badlands, and all the way east to the Salton Sea. There was no place to camp along Fonts Point Road, so we crossed over to Clark Dry Lake. Mesmerized by the setting sun lighting up the tops of the Santa Rosa Mountains, we drove many miles on narrow, brittle Rockhouse Road, finally setting up camp near a small promontory tagged as "noll" on my topo map. I sat for a long time just listening to the warm wind wandering up the valley, and watching the stars come out one by one. 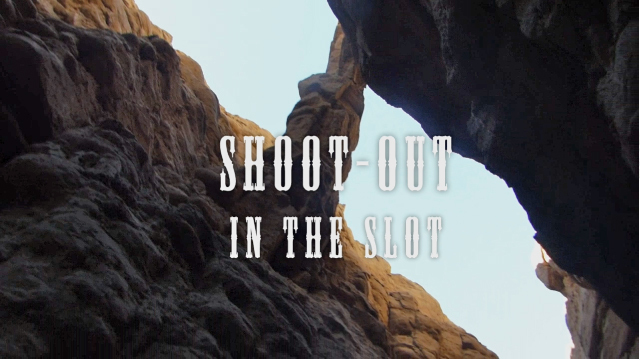 The rally was taking place at Ocotillo Wells, but "The Slot" was on the way there, just a few miles off the main road. We did this hike on our previous trip, but it was one of our favorites, and definitely worth re-doing since the canyon was a welcome refuge from the heat of the day. I'd like to claim we set this up ahead of time, but it was improvised on the spot. On to Ocotillo Wells, which bills itself as "The OHV Capital of the World." The "Discovery Center" was nice enough, with a wheel of covered picnic tables around a central firepit. But the air was white with clouds of dust kicked up by hundreds of ATVs, all buzzing like a cloud of angry hornets. We checked in, picked up our T-shirts and made a beeline for Fish Creek. By now there were campers in virtually every pull-out, but we finally found a spot by nosing into Oyster Shell Wash. In the morning we realized we were at the trailhead for Wind Caves, another of our favorites hikes from our previous trip. Near the top I had a few faint bars of internet, which we used to figure out a route to the oyster shell reef we'd heard so much about. Using our Gaia GPS, we made our way cross-country toward Elephant's Knees, sliding down a dry waterfall to return to Fish Creek and then slogging up Mud Hills Wash.
We wandered over giant mounds of spongey dried mud, shimmering with shards of gypsum. he reddish brown talus at the base of Elephant's Knees is the remains of a two-million-year-old oysters reef, packed with dusty shell fragments. We returned to the rally site for dinner and a hot shower. As the sun set, I was mesmerized by the glow of multi-colored lights on ATVs crawling up and down Squaw Peark, diffused by dense clouds of dust. We took the long way home, continuing on CA 78 high into the mountains that cast a permanent rain shadow over much of Anza Borrego. We stopped just long enough in the tourist town of Julian for water, gas and one of their famous pies. Veering south on CA 79 and S1, we passed through some truly lovely country, where boney mountains offer breathtaking views of the desert below. The Laguna Mountains were resplendent with the colors of fall, but there were dozens of cars and every pull-off (so no photos). We paused to visit some roadside attractions in Jacumba, where old US 80 dead-ends at a cliff and I-9 plunges nearly 3000 feet to the desert floor. Desert View Tower and Coyote's Flying Saucer Retrievals and Repair Service. The mysterious hot springs just off I-8 is a great place to freshen up and eat a piece of pie before heading for home.